This Mexican Chopped Salad with Creamy Cilantro Avocado Dressing make a great light lunch. Or top it with chicken to make for a heartier dinner! I love the versatility of salads. They make great light lunches or hearty dinners depending upon how you prepare them. We often make salads with Mexican flavors because we all enjoy them. This fresh Mexican Chopped Salad is substantial enough to serve as a light main course on its own. It’s a delicious, healthy dish loaded with fiber-rich black beans and lots of fresh veggies and herbs. If you’re looking for a heartier meal, you can top it with grilled chicken or serve it with your favorite soup. And the Creamy Avocado Cilantro Dressing is the perfect final touch for this yummy meal. This fresh Mexican chopped salad is substantial enough to serve as a light main course on its own. Or, you can pair it with your favorite soup for a heartier meal. 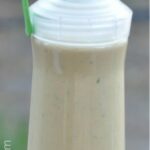 Place all ingredients for the salad dressing into your blender or food processor then blend until smooth. You can add a little water if you need to adjust the consistency. Taste and adjust seasonings if desired. Cover your salad dressing and place in the fridge until you're ready to serve it. This will help the flavors meld. When you're done making the dressing, brush the corn with melted butter and place on a pre-heated gas grill over medium direct heat, or indoors on a grill pan sprayed with non-stick cooking spray set over medium-high heat. Grill the corn until the kernels are slightly charred, rotating the corn a quarter turn every couple of minutes until it's done all around. Remove the corn from the grill and cut the kernels from the cob with a sharp knife. Set kernels aside and throw away the cobbs. In a large salad bowl, add the chopped iceberg, arugula and cilantro and toss gently to combine. Set aside. Add the diced bell pepper, red onion, black beans, roasted corn kernels, lime juice and ground cumin to a large mixing bowl. Season the ingredients with sea salt and black pepper, to taste, then toss gently to combine. Add the seasoned black bean mixture you just made to the salad bowl with the chopped lettuce and toss gently to combine. Serve immediately topped with Creamy Avocado Dressing or your favorite salad dressing. Enjoy! If fresh corn is not in season, substitute 1 cup prepared frozen sweet corn and skip Steps 2 and 3 below. Please leave a review after you try this Mexican Chopped Salad recipe!